The Exhibition Hall for Sanya stopover of Volvo Ocean Race 2011-12 was opened to the public on 21th Jan at Sanya Luhuitou Peninsula Yacht Dock. 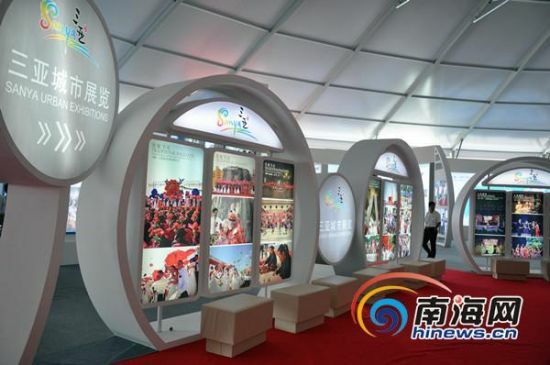 As one of the supporting projects of the Sanya stopover of Volvo Ocean Race 2011-12, the Sanya Dragon New Year Carnival Exhibition Hall was opened to the public on 21th Jan at Sanya Luhuitou Peninsula Yacht Dock. Covering a land area of 30,000 square meters, the Exhibition Hall features 10 different themed pavilions, which are Sanya Pavilion, Yalong Bay Pavilion, Haitang Bay Pavilion, Orchid Pavilion, Rose Pavilion, Cruise Ship Pavilion, Real Estate Pavilion, Creative Pavilion, Technology Pavilion, and Luhuitou Peninsula Pavilion. The exhibition is aimed to display the different aspects of Sanya to help visitors better learn about the charm of this tropical tourist city. The exhibition hall is open to the public from 10:00am to 10:00 pm on 21st Jan to 19th Feb. In addition, the Destination Village for VOR 2011-12 Sanya Stopover will be open free to the public from 4th to 19th Feb. A series of activities will be held in the village during the period. The Volvo Ocean Race fleet is expected to arrive at Sanya Luhuitou Peninsula Yacht Dock between 4th and 6th Feb. A welcoming ceremony will be held to welcome the six strong VOR fleet. The number of expected visitors including professional sailors, sailing enthusiasts and tourists will total 350,000 to come together for the world’s largest sailing event.